I'll briefly talk about what the Letters for Louise project is if you haven't heard of it already, but here are the links to the two previous blog posts for more information, in case I miss something! Back in September, I was completely at my wits end about the way ME seemed to be shaping my life (I'd just had to give up the job I loved and had worked so hard for), and the worst thing was that there seemed to be so many people I came across who just didn't 'get' ME. We've all come across them I'm sure- those who think ME is glorified tiredness, a way of attracting attention or sympathy, or an excuse to go through life, having fun by doing the bare minimum. I was talking (more like ranting) to a friend one afternoon and said something like 'it's just a shame there isn't anything with loads of ME sufferers saying it how it really is'. And I can remember thinking that maybe I could get something together. Something where there were loads of us sharing our stories, and where we could all say 'it's not just me'. And that's where the Letters for Louise project came from. Since September, I've been putting together a book where lots of lovely people have been writing letters. Initially the idea was for people to write letters addressed to anyone in their life who has shown them a lack of understanding, disbelief or neglect about ME. But actually, I've had some lovely, really touching letters addressed to people who DO get it. Those very special people who are always there and are just amazing. And actually they have just as much of an impact as the ones to people who haven't been so good... it's been amazing to have both types of letters. I want to take this opportunity now to thank every single person who has sent me something SOOOOOO much. I'm very humbled by the fact that I now have around 80 letters- that is staggering and something that I never had thought would happen. You are all just the best and if there is one good thing about ME, I think it can really show community spirit at its best and this just proves it. I wish I could personally come and give you all a massive hug (or a big smiley wave if you are touch sensitive!!). There's still time to get involved! I'm hoping (and am on track) to get the book published for the start of ME Awareness Week. Therefore I am asking for all letters to be with me by Monday 31st March. It was be absolutely wonderful if we could get to 100 letters- this is really shaping up to be a very powerful (and hopefully very helpful) book thanks to all of your fantastic contributions. If you want to be involved, you can choose to have your name included or to remain anonymous. You don't have to write an essay- you can write as much or as little as you want, and you can write as many letters as you want, all addressed to whoever you want. You can either email letters to me at looby_louness@hotmail.co.uk (awful email address I know, but I've had it since I was about 14...!) or you can join the closed Facebook group Letters for Louise! where there's a lovely supportive atmosphere building as people share their letters. This is your chance to get your voice heard! I turned 25 just over a week ago, and it made me think a lot about my personal journey over the years with ME. At one time I was bed bound for around six months, and I'd never have thought then that any good could come out of having ME. 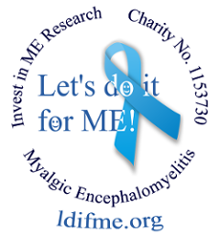 But as I said in my last blog post, the lovely people at IiME and 'Let's Do It for ME!' have inspired me by always being so positive and upbeat and really making the most of the cards they've been dealt... I've met so many brilliant people through this project (and never thought I'd be publishing a book...) All the profits from the book (and lots of virtual hugs) will be going to IiME! We're so close to getting the book out there now. I've started the whole proof-reading/ organising process (the spell checker constantly tries to change 'myalgic' to 'magical'... if only!) and I've got someone completely fantastic and very talented designing the cover. All it needs now are more of your amazing letters.